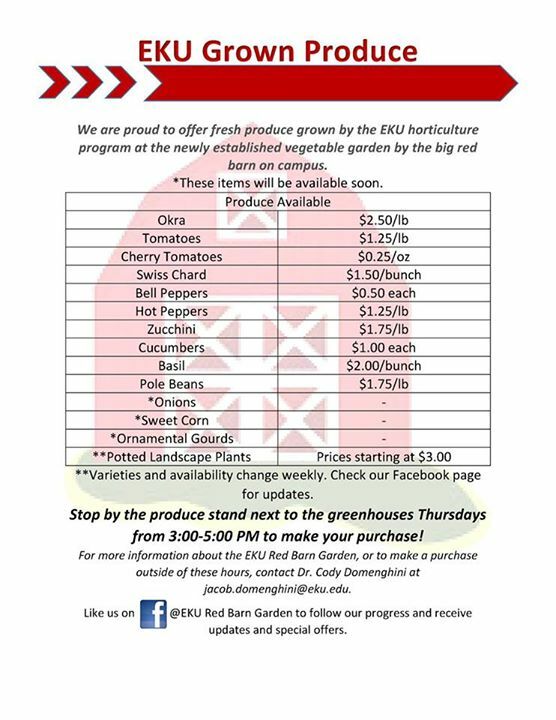 EKU Horticulture students are pleased to offer fresh produce grown at their newly established vegetable garden. Their production area is located by the Red Barn Garden near EKU's Agriculture Department home on the Richmond Campus. Produce sales will be on Thursdays, beginning August 20, from 3:00 to 5:00 pm at the Red Barn Garden Produce Stand which will be adjacent to the greenhouses. Sales will run on Thursdays through mid-November. According to program coordinator Dr. Cody Dominghini, "This first year is a 'trial' year. The plan is to have a sale most Thursdays this semester. We will probably stop having the stand a week or two before Thanksgiving." 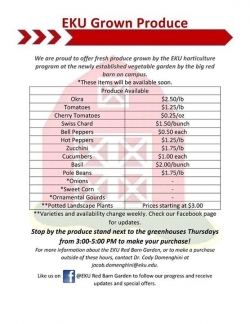 "The EKU Red Barn Garden is a hands-on learning tool for students in the fruit and vegetable production program at Eastern Kentucky University," said Dominghini. Find out more about the project on their Facebook page: https://www.facebook.com/pages/EKU-Red-Barn-Garden/. Or contact Dr. Domenghini at jacob.domenghini@eku.edu | 859-622-2234.